After a great dinner at the Local in Jackson full of raw elk meat and Black Maple Hill Bourbon followed up by a few drinks at the Million Dollar Cowboy bar the 5 AM wakeup time was not welcomed by anyone. We had agreed to get on the bikes at 6 AM but when 6 AM came only three of the six of us were out by the bikes. Saddle time would be 6:45 today as we headed toward the Grand Tetons and Yellowstone. 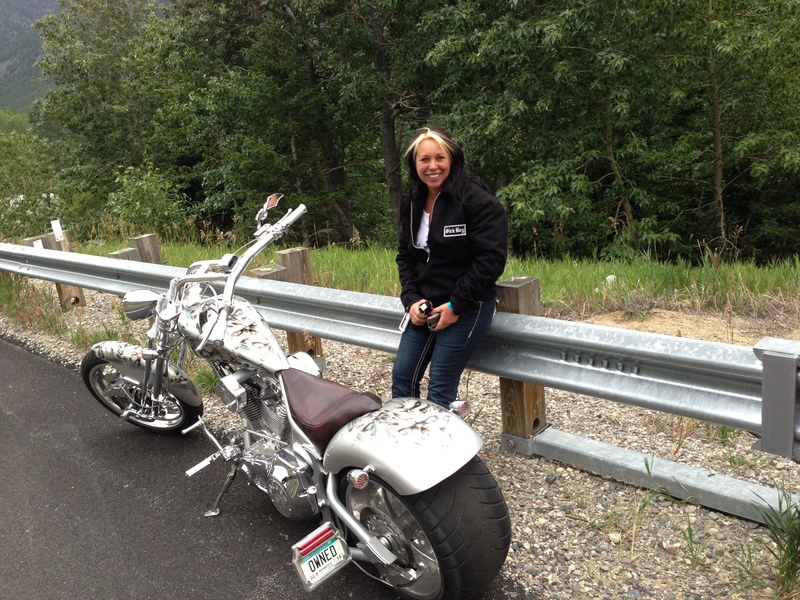 The ride from Jackson to the Grand Tetons was frigid. A few of the guys needed to change gloves only a few minutes into the ride and I found myself ducking behind the fairing to cut down on some of the blustery wind. After 50 miles we stopped for a few photos and then entered the Grand Teton National park (the price of this park was $20 – slightly higher than the $12 that allowed entry to Zion and Bryce Canyon back in Utah. The views in the park have been spectacular though the number of animals we have seen is far less than I remember last year but there is still another 75 miles of park to go as I’m sitting in Canyon village right now. With that said, the amazement of the five guys with whom I’m riding when they saw a Bison approach a car was something I won’t soon forget. 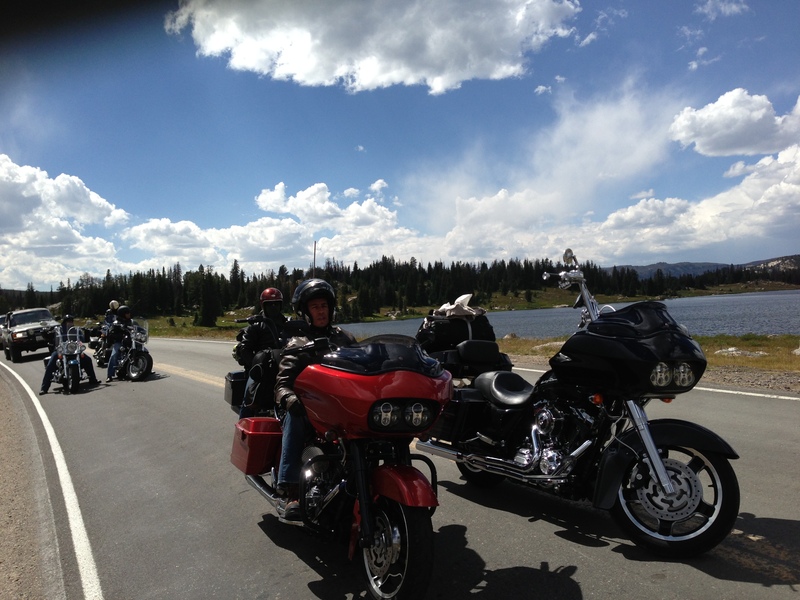 We Plan to continue on to Cooke city and then Beartooth Pass. From there we will have a 350 mile run to Sturgis and will hopefully be in tonight as long as traffic cooperates and we can limit time at the rest stops. 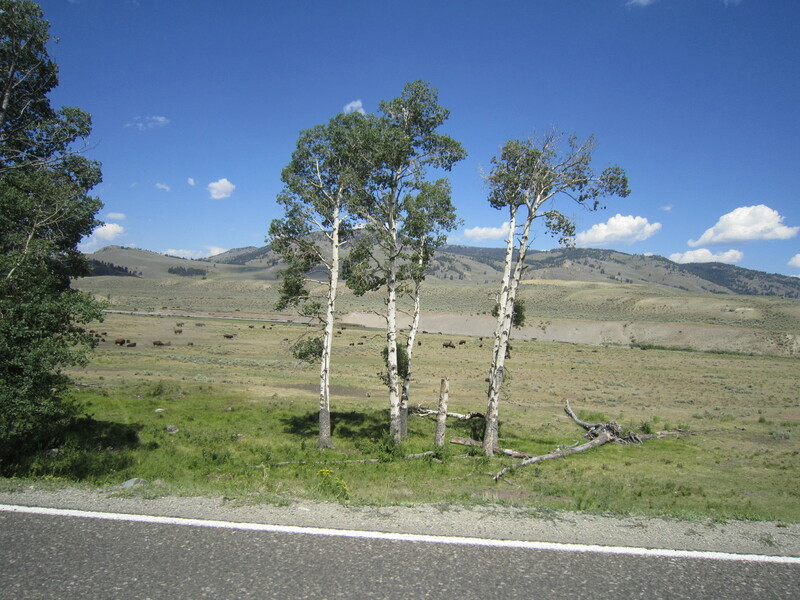 We rode through Yellowstone and finally had a chance to see some more Bison. In fact we saw a few of them fight which was definitely a highlight for the trip. 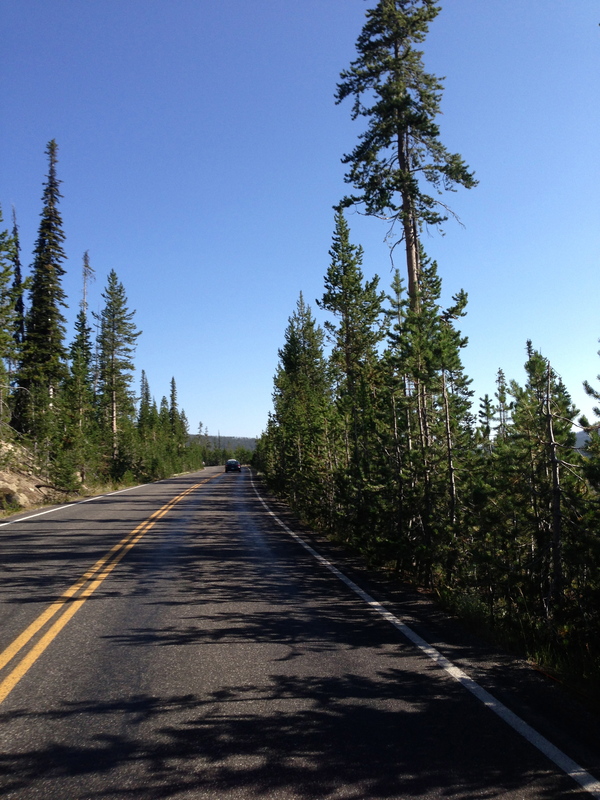 Many of the Yellowstone roads were great. Twisty, high speeds and little traffic. We found ourselves at the end of a 9-mile run in a three mile construction induced traffic jam. The traffic continued until North Entrance Rd where we would have another 36 miles until the park exit. 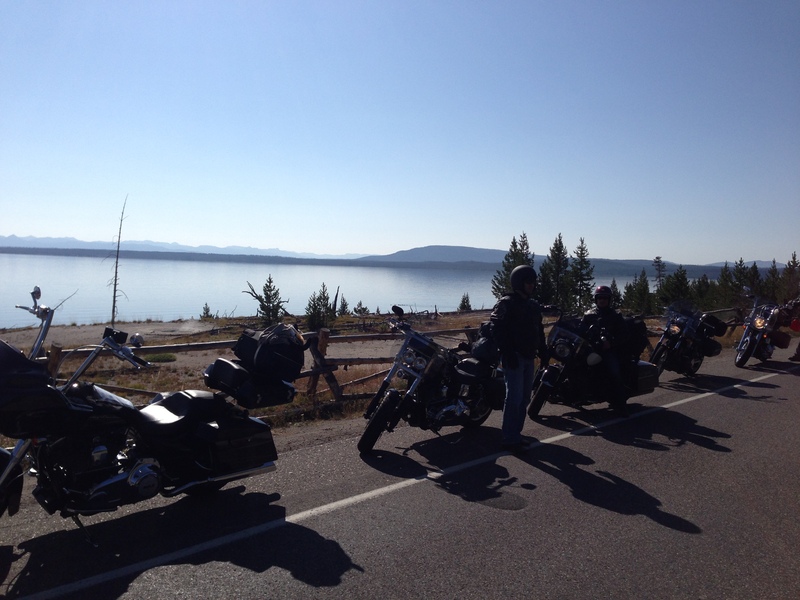 I definitely enjoyed this year’s ride though Yellowstone more than when I did the same ride last year. Last year had scattered thunderstorms and required changing in and out of raingear a half dozen times. Wearing raingear in 95 degree heat is also one of the most miserable parts of a ride but is unavoidable when riding in the summer. At 1PM we exited the park, and the timing for lunch was perfect. I made the call to hit up Miner’s Saloon in Cooke City – a favorite of mine from last year where they serve Buffalo Burger and Riblets. Both are fantastic for a long ride and to soak up some of the water we would be chugging to stay hydrated. The bar is a pretty large place but was empty upon our arrival. We cued up some music from the very small jukebox selection and listened to Stevie Ray Vaughn, Kenny Rogers and Eric Clapton until our food was done. We also used the opportunity to dress in slightly heavier layers to take on Beartooth Pass. Beartooth pass is a 50+ mile road that Charles Kuralt named one of the nation’s most scenic byways. It gets up to 10,942 ft above sea level and has some of the nicest roads to carve in the land. Unfortunately it also had construction and a bit more traffic than the run I did last August. 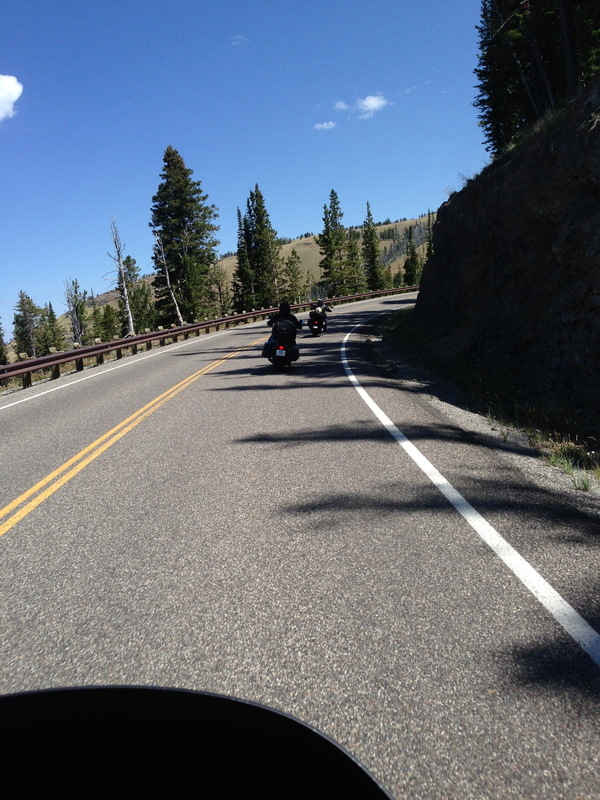 After leaving the pass and riding about seven miles before Red Lodge, we saw a broken-down biker. We would learn that her name was Crystal and her Bourget’s gearbox gave out. We didn’t feel good with her sitting out there alone (this areas has one of the largest Grizzly Bear populations in the country) so we offered her some Bear Spray and then ultimately decided to wait until her tow truck arrived. We also agreed to meet at the Full Throttle on Thursday to grab a drink. Hopefully her bike is running and we will see her later in the week. We also joked that due to stopping and waiting for her tow, we would have great bike karma for the rest of our trip. We would learn this would not be the case. 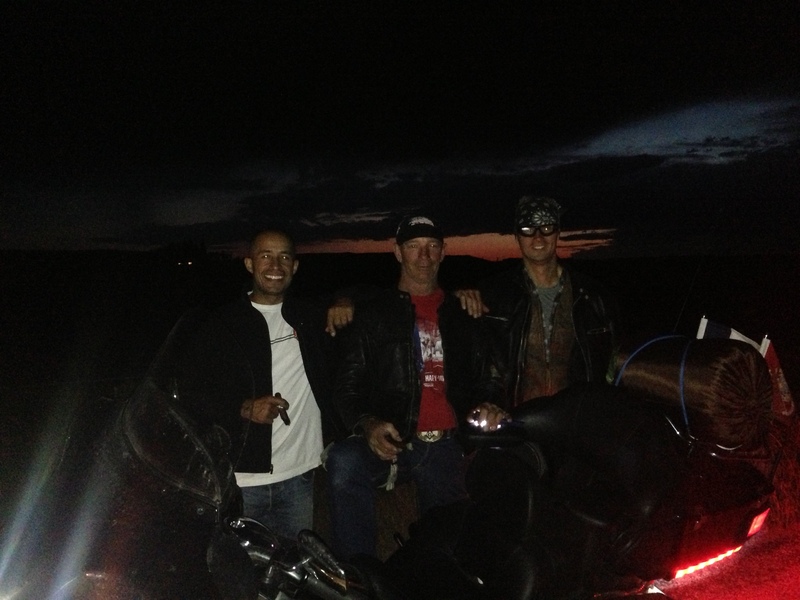 We have 350 miles until Sturgis. Right now it is 4:06 PM and we needed to make great time to get to Sturgis before missing the Kid Rock concert – clearly this was a major concern! We made great time until our next fill up even though it was only 50 miles down the road. We love our friends with smaller tanks but are urging them to invest in touring models for the next trip. At the station we gassed up and as has become tradition by this point, those who topped off first, waited by the station exit. Waiting there was an early 50s man on an Electra Glide flying both a USMC and Texas Flag off the back. We had a little small talk and I noticed he had a pistol strapped in a tactical holster half way down his right thigh. We weren’t sure why he needed this level of protection but definitely were intrigued enough to meet him. 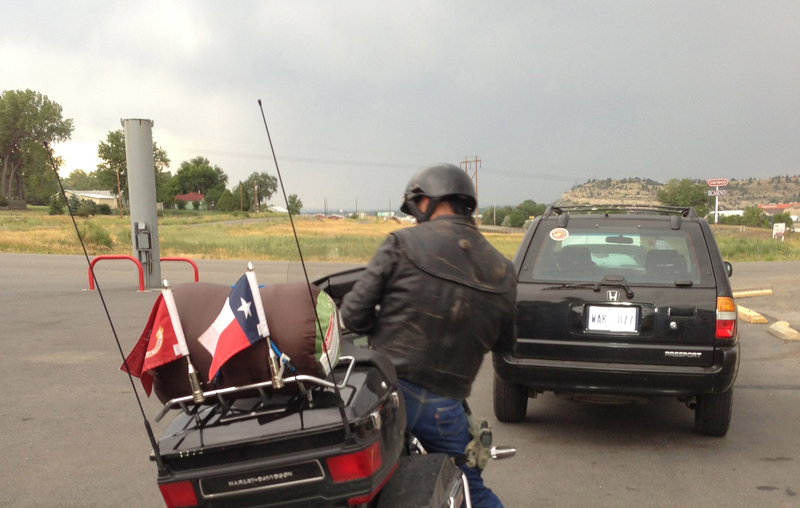 His name was Buddy and he had already ridden from Texas City, TX through the Western half of the US, racking up 4,500 miles on his way to Sturgis. I was impressed and wanted to hear his stories. I also remember from my solo cross-country trip how nice it was to ride with a crew on occasion so I offered him to ride with us for a bit. He eagerly obliged and we set out East to Sturgis. 320 miles to go. I ride on the front left and Jimmy has tagged me as the “Road Captain” – likely because I did most of the route planning and my Road Glide has the GPS. Josh usually rides in the middle of the pack so it was odd that not more than 40 miles after we met Buddy, Josh pulled up next to me pointing at his dash. Apparently the check motor light had recently illuminated – we would have to take exit 451 off of 90 and check on the bike. We pulled into an abandoned hotel on an Indian reservation that had a store selling “Indian Tacos”. The place definitely looked like a shady brothel with the boarded up windows and a few cars parked around the back. We would shut down Josh’s bike and open the fuel cap to see if it was just the fuel pressure causing a light (this happened to me a year ago”. When we went to restart the bike, it clicked like a battery was dead. Jimmy and Bill, our two techs suggested we clean the battery terminals and recheck the connections. We did and it started back up but we were sure that it either needed a new battery or a battery regulator. We would spend the next 45 minutes trying to locate a battery that would fit Josh’s 2005 Victory 8 Ball and make plans for a store clerk to leave the battery outside should the store close early. We did find one place on our way but it was 175 miles from our current location. There was little chance that Josh’s bike would make the 175-mile trip but we decided to give it a shot as our options were limited. We push started the Victory and were back on I-90 in the middle of Wyoming. The Kid Rock concert was officially out of the plan. Five exits down the road at around 7:00 PM, Josh’s bike sputtered and then died. 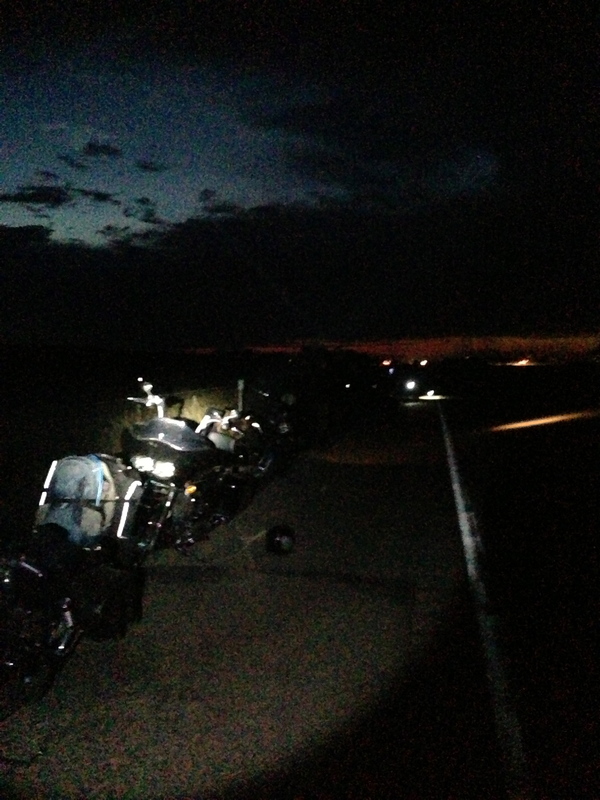 We were stuck – breakdown lane at dusk in the middle of nowhere. Just the six of us with our pistol wielding friend, Buddy. 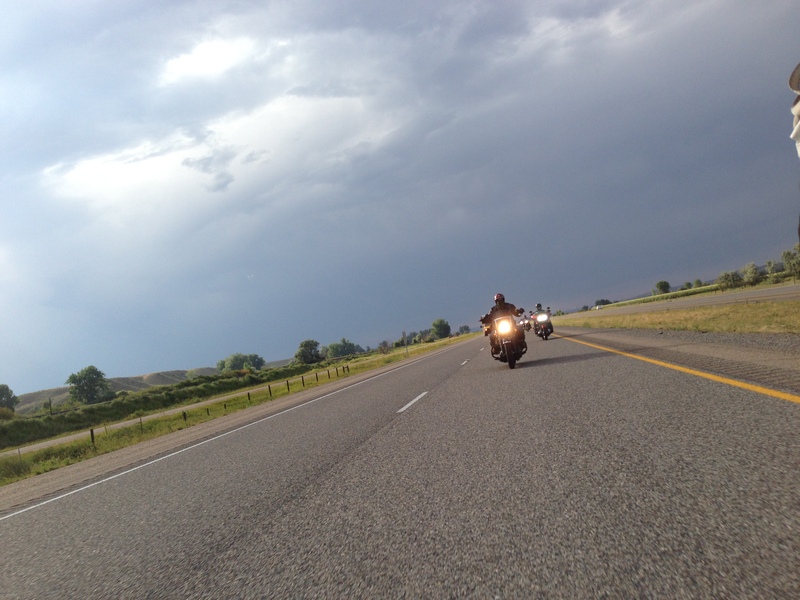 We were 276 miles from Sturgis and it was getting dark. Let’s consider our options. We went with option 4. Screw it, we had been riding all day and I wanted a smoke. 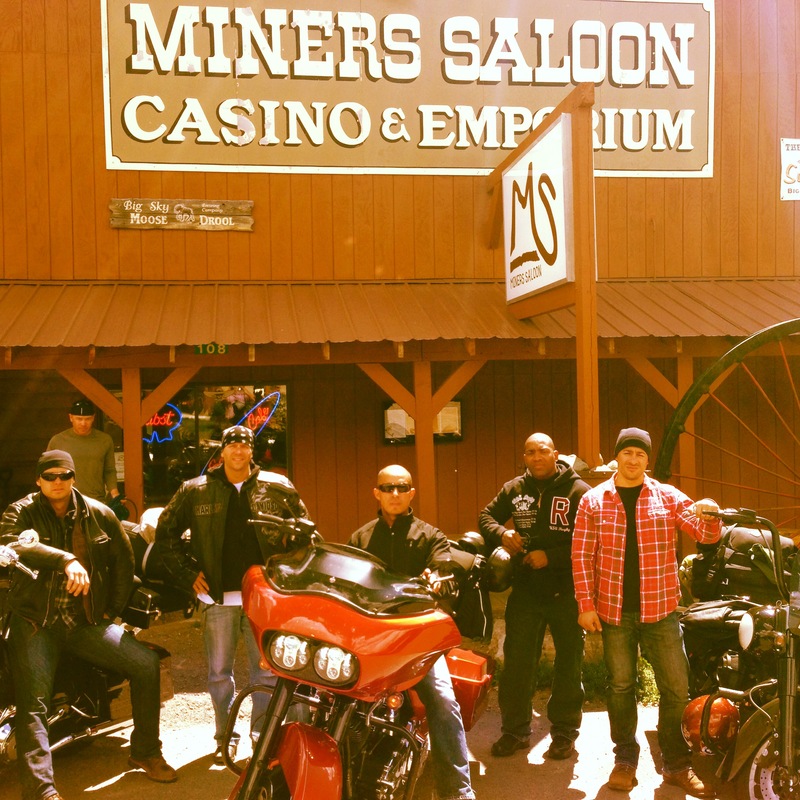 Needless to say, nobody pulled over to help the motley crew of bikers on the side of the road. Clearly we didn’t look helpless enough. Back to the cigar and try options 2 and 3. 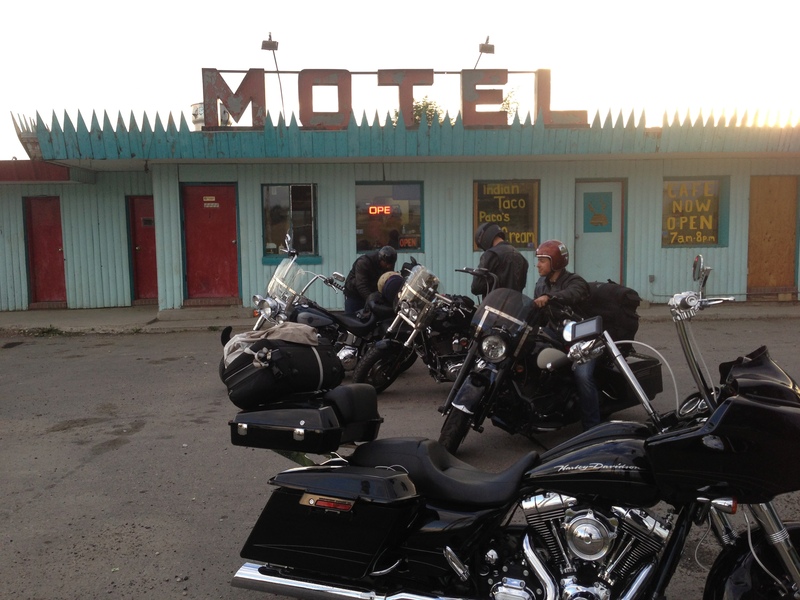 There wasn’t a Victory store between here and Rapid City (35 miles further than Sturgis). This cigar is still smoking – it’s been 90 minutes and it’s still great. I’ll have to pick up a box. The brand, for anybody keeping score was Alec Bradley. We called AAA and Harley. AAA allows 100 miles free and Harley said they’d give a $100 credit. We opted to go with AAA and wait. It wouldn’t arrive until at least 9:00 PM and maybe later. 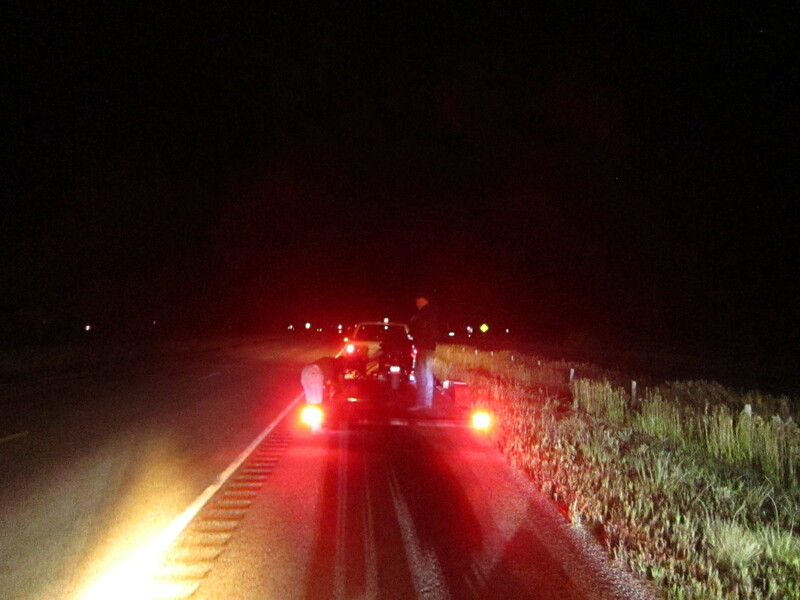 Waiting was a stressful affair as it became darker and darker until we were in pitch black with only a few flashlights and a small camping lantern to illuminate ourselves in the 4 ft narrow right-hand breakdown lane of a 2 lane highway. To make matters worse, our refuge was partially hidden due to the location of a hill a quarter mile back. 18-wheelers would race by us and fail to move to the left lane until the very last second. Of course a lightning storm started to move in and we received a little rain. This wasn’t bad – it would have been worse but we just assumed something new would go wrong. Josh was pretty pissed but held it together well. The rest of us were actually in great spirits as we knew bike problems on such a trip were a reality and had agreed to work through anything that came about. We would work through this and get Josh’s bike on a flatbed before setting out 276 miles for Sturgis. I was amazed that nobody pulled over – not even the one state trooper who could have helped by putting his lights on to reduce our chances of being plowed over by a mac truck. Protect and Serve brother – thanks for nothing. A Mass Statie would’ve helped, no doubt. Buddy stuck around almost the entire time. He felt a duty to his newly found comrades and waited for the tow. Eventually I told him he should hit the road. I didn’t want to take a chance with him getting tired on the ride as we would have been partially responsible should anything happen to him on the ride. We took a picture, bid him farewell and he was off. Buddy was a good guy and we hoped to run into him later in the week. 10:30 – the tow truck arrives. We load Josh onto the truck and start our ride. 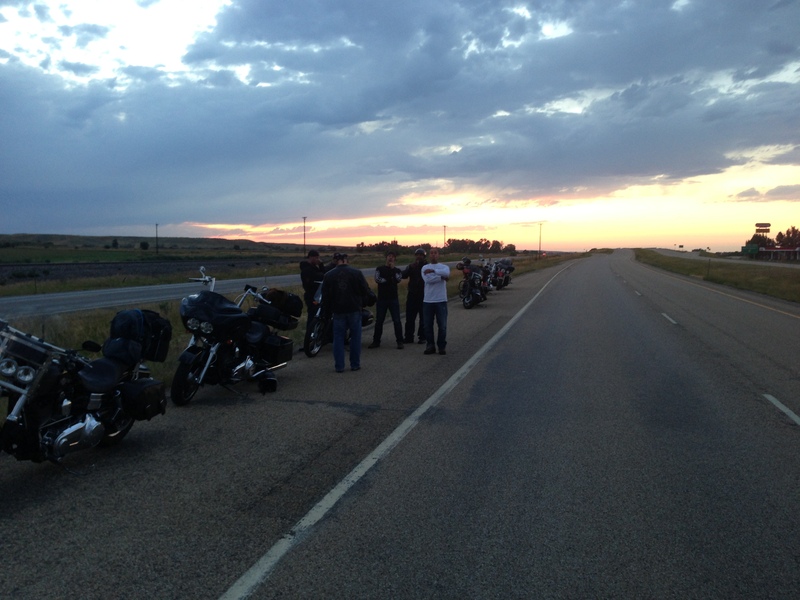 The GPS said we would be in Sturgis around 3:30 but likely that meant 4:30 with stops. Jimmy and I have Daymaker lights on our Road Glides and rode tandem across the two lanes to light the margins for the other three. We saw deer – by the pack. With Antlers and I believe some even had aggressive tattoos. Every sighting, and there was many, sent shivers down my spine. Our heads were on a swivel as we worked hard to keep up speeds of 90 MPH and play Froger with Bambi. At times I wished for a dimmer light as I wouldn’t have seen so many deer – Blissful Ignorance. We had seen no less than 50 deer but realistically I lost count. They were on the side of the road. They crossed the road. Some ran away from the bikes and some where intrigued and ran toward us. This riding was getting tiring. I had to tilt my mirrors down to keep the trailing lights out of my eyes – those lights were cutting down peripheral vision saved for deer spotting. As a result, I couldn’t see cars on my tail. At one point, an SUV with US Army painted on the side was riding my tail. Jimmy signaled for me to move to the right and I let the SUV race by. My exhaustion kept me from realizing just how close he came to hitting me. Apparently I had to worry about more than the wildlife now. Each 100 mile stretch would be harder than the last as we pushed from station to station filling up on Redbull, coffee, sugar and jerky. We all picked up snacks for the road including cookies and mini-twizzlers to munch on during the ride. Snacking helps focus on something other than exhaustion and the sugar gives a temporary boost… far too temporary. We were all feeling the 5 AM wake up by this point as well as last night’s 3 hours of sleep. Finally we would get off I-90’s Deadwood exit. We were within 10 miles from our rental house. The road was twisty and looked like a fun ride until we saw yet another group of deer. There would be no fun on this short stretch either. Vigilance was the order of the day. The gravel sloped down 10 inches. The rocks were loose. I was tired. The Roadglide’s 18 inch front wheel was turned and stuck. I put my feet down but it was too late. The bike would be on it’s side. Unreal. We had done it – 276 miles with deer-lined roads and made it without a scratch until now. Side note, if throwing Bell ¾ helmet’s was an Olympic event, I’d be sporting gold medals. We picked up the bike and loaded it into the garage. Slightly scratched motorcycle and majorly frustrated rider. We had been up for 23.5 hours. Rode 650 miles. 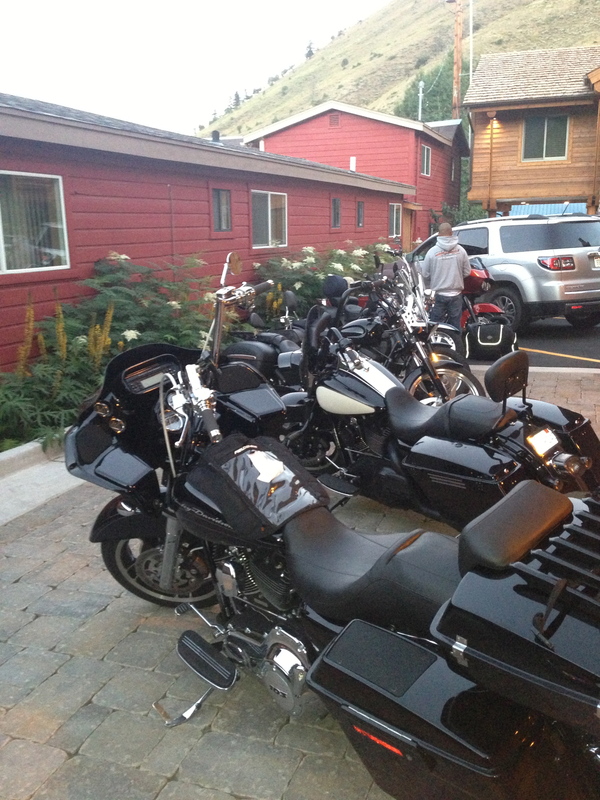 Only 5 of the six rode into Sturgis and now my right saddlebag had some new Sturgis Scratches. This would require some Tequila. Josh arrived back at the house and shared the $850 cost of the tow. Ouch. At least his bike was now at Victory where Jimmy and I could see what could be done in the morning. Alec Bradley makes some fine cigars . One brand, American Classic, is a good smoke and inexpensive.